Google Flights is one of the most powerful tools for finding the best airline deals and routing. It can save you a ton of time relative to searching around on the websites of individual airlines, and it works well for both domestic and foreign airlines. It even has features built in to help you find great airfares even if you don’t know exactly where you want to go. More on that below. But first, what it it is how it works. 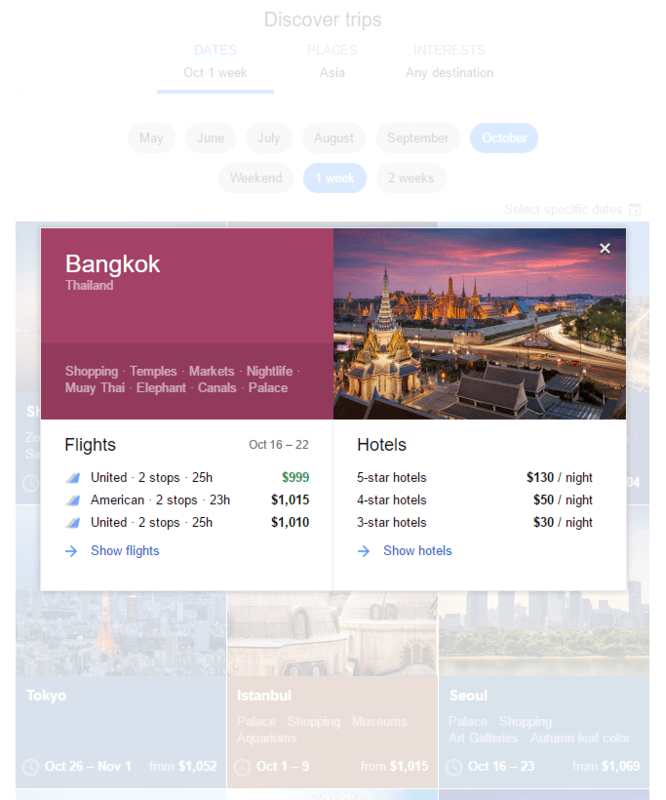 Google Flights as we know it today began in 2011 when Google purchased the software called ITA matrix, a powerful tool for searching for airfare that was developed by a team of MIT computer scientists. It allows for extremely customizable and complex searches and returns a wide range of results. The only downside is that it is not the most user-friendly tool and requires some getting used to in order to maximize its potential. This is where Google Flights comes in. It is powered by ITA matrix and has most of the functionality, but has a more polished and user-friendly interface. The homepage of Google Flights has a clean and fairly simple interface. At the top of the screen you have a few basic search options. First, you can choose between round-trip, one-way, or multi-city searches. Then you choose your desired class of service and number of passengers. Finally, enter your departure and destination cities and dates. You can specify the airport or allow for any airport around a particular city. 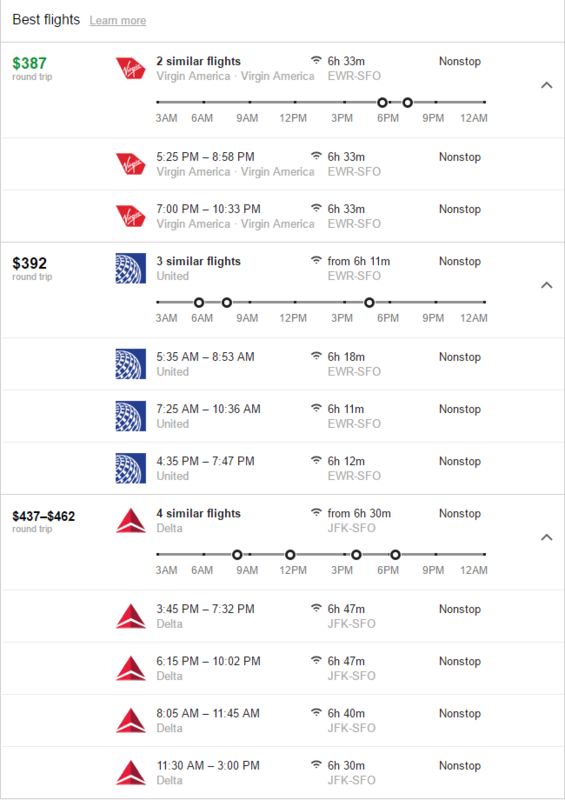 Below is an example of a search for a round trip between New York and San Francisco. Before we get to the specific search results, notice that Google offers two options right at the top of the results screen. The first is suggestions for similar flights that currently have a lower price. In this example, we entered a Saturday to Saturday search, but Google says we can save $73 by making it a Friday to Friday trip. Secondly, Google offers the option to track prices. 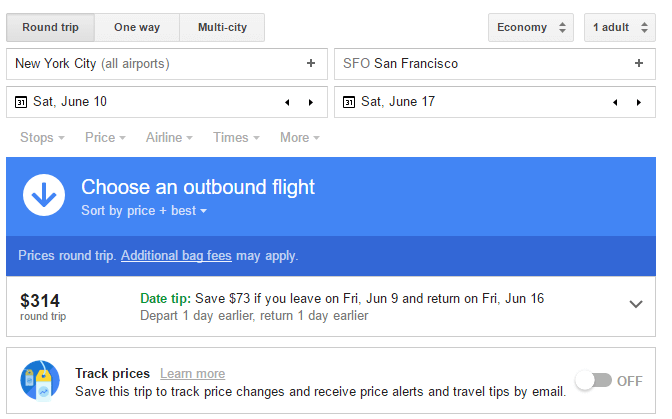 If you enable this feature, you will get emails when the price of your trip changes that notifies you of the new price. Also, don’t worry about having your inbox cluttered with tons of flight alert emails. Google makes it very easy to navigate to your tracked price screen and turn off tracking if you no longer desire updates. Below this section will be the results for individual flights. Google puts what they deem to be the “best” flights in a separate section at the top. The primary factors which determine which flights are the best are price, duration, and number of stops. The ideal flight is a cheap non-stop flight. If multiple flights with similar characteristics exist, they will all be displayed, and you can base your decision on factors such as time of day. In the example below, there are three flights in the “best flights” section. However, each of these flights has multiple options, as denoted by the language such as “2 similar flights.” If you click on each flight, the remaining options will drop down, allowing you to see each time of day the flight is offered. This example has three flights on Virgin America, four flights on United, and five flights on Delta. All of these are nonstop flights. Clicking the “show flights” link will lead back to the main results screen that we showed in the first example. The best flights will be displayed at the top, and then numerous other possibilities below that. There is also an option to “show hotels” which will display a map of hotels and a list of properties and prices. When only using the date and place tabs, the results are returned at a very high level. In general, when doing international searches, you will only get countries, not cities within those countries. However, you can focus the search by using the interests tab. For example, if we select “beaches,” we get several results in Thailand for cities that have beaches or at least have them nearby. There are results for several other countries as well, but each result is displayed at the city level. The stops menu allows you to choose between any, nonstop, one or two stops. The price filter is simply a slider tool allowing you to set a maximum price. The airline menu is a bit more complex. You may select one of the three major airline alliances, which is especially useful if you plan on making an award booking, or want to purchase a paid ticket and credit the miles to a partner airline. You can also choose to select or exclude specific airlines, which is a great filter when looking for routings for mileage award booking where you want to avoid certain carriers because of high fuel surcharges. The times menu allows you to set departure and arrival times individually for your outbound and return flights. The “more” menu has three types of options: duration, separate tickets, and connecting airports. The duration filter is a slider that allows you to set a maximum flight length. The “separate tickets” filter allows you choose whether or not you want Google to display results that would force you to book separate tickets, typically two one-way tickets on separate airlines. This requires a bit more work on your part, but can result in substantial savings. Lastly, you may select or exclude specific airports for your connection. This is most useful if you are planning to stopover in a connecting city. So there you have it. 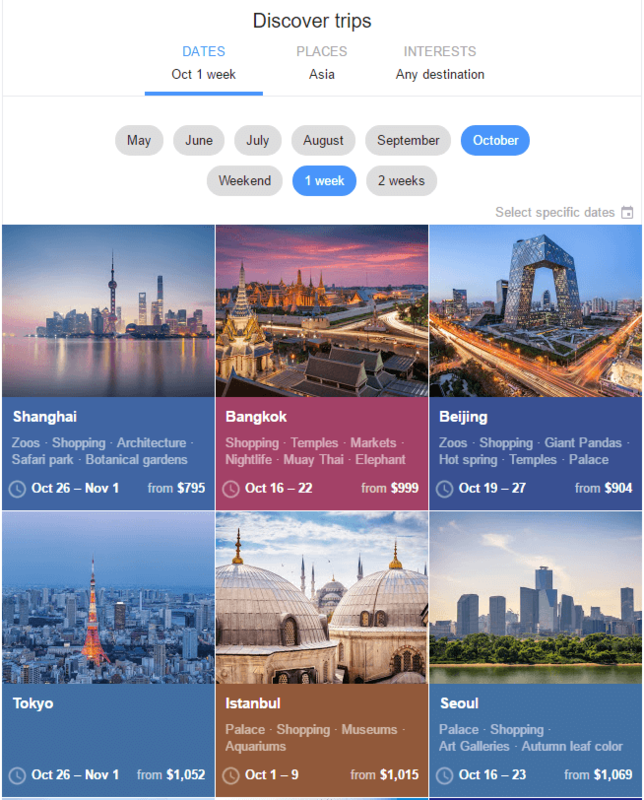 Google Flights can help you find the best deals if you are paying for the ticket, and the best routings and carriers if you are booking an award ticket.